Ḥakam of Curaçao, Dutch West Indies; born at Amsterdam Jan. 28, 1810; died there Sept. 18, 1882. He received the various rabbinical degrees (that of "morenu" in 1846) at the celebrated bet ha-midrash Ets Haim. In 1848 he was awarded the royal gold medal for the best sermon in the Dutch language. 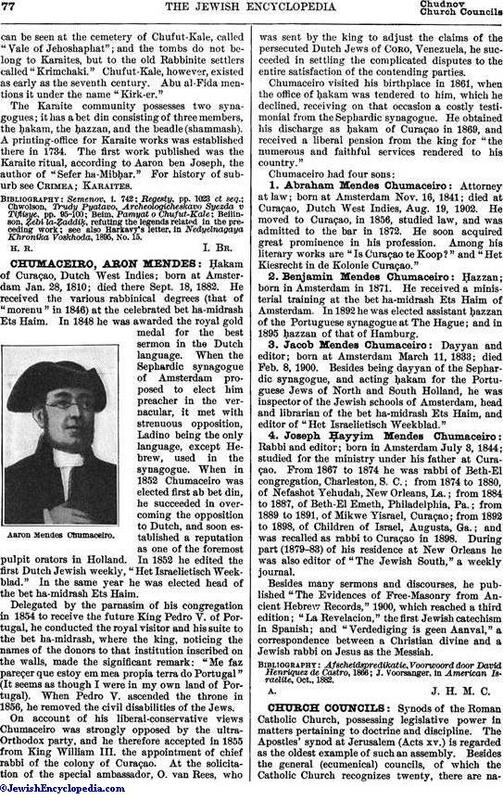 When the Sephardic synagogue of Amsterdam proposed to elect him preacher in the vernacular, it met with strenuous opposition, Ladino being the only language, except Hebrew, used in the synagogue. When in 1852 Chumaceiro was elected first ab bet din, he succeeded in overcoming the opposition to Dutch, and soon established a reputation as one of the foremost pulpit orators in Holland. In 1852 he edited the first Dutch Jewish weekly, "Het Israelietisch Weekblad." In the same year he was elected head of the bet ha-midrash Ets Haim. Delegated by the parnasim of his congregation in 1854 to receive the future King Pedro V. of Portugal, he conducted the royal visitor and his suite to the bet ha-midrash, where the king, noticing the names of the donors to that institution inscribed on the walls, made the significant remark: "Me faz pareçer que estoy em mea propia terra do Portugal" (It seems as though I were in my own land of Portugal). When Pedro V. ascended the throne in 1856, he removed the civil disabilities of the Jews. On account of his liberal-conservative views Chumaceiro was strongly opposed by the ultra-Orthodox party, and he therefore accepted in 1855 from King William III. the appointment of chief rabbi of the colony of Curaçao. At the solicitation of the special ambassador, O. van Rees, who was sent by the king to adjust the claims of the persecuted Dutch Jews of CORO, Venezuela, he succeeded in settling the complicated disputes to the entire satisfaction of the contending parties. Chumaceiro visited his birthplace in 1861, when the office of ḥakam was tendered to him, which he declined, receiving on that occasion a costly testimonial from the Sephardic synagogue. He obtained his discharge as ḥakam of Curaçao in 1869, and received a liberal pension from the king for "the numerous and faithful services rendered to his country." Attorney at law; born at Amsterdam Nov. 16, 1841; died at Curaçao, Dutch West Indies, Aug. 19, 1902. He moved to Curaçao, in 1856, studied law, and was admitted to the bar in 1872. He soon acquired great prominence in his profession. Among his literary works are "Is Curaçao te Koop?" and "Het Kiesrecht in de Kolonie Curaçao." Ḥazzan; born in Amsterdam in 1871. He received a ministerial training at the bet ha-midrash Ets Haim of Amsterdam. In 1892 he was elected assistant ḥazzan of the Portuguese synagogue at The Hague; and in 1895 ḥazzan of that of Hamburg. Dayyan and editor; born at Amsterdam March 11, 1833; died Feb. 8, 1900. Besides being dayyan of the Sephardic synagogue, and acting ḥakam for the Portuguese Jews of North and South Holland, he was inspector of the Jewish schools of Amsterdam, head and librarian of the bet ha-midrash Ets Haim, and editor of "Het Israelietisch Weekblad." Rabbi and editor; born in Amsterdam July 3, 1844; studied for the ministry under his father at Curaçao. From 1867 to 1874 he was rabbi of Beth-El congregation, Charleston, S. C.; from 1874 to 1880, of Nefashot Yebudah, New Orleans, La. ; from 1884 to 1887, of Beth-El Emeth, Philadelphia, Pa.; from 1889 to 1891, of Mikwe, Yisrael, Curaçao; from 1892 to 1898, of Children of Israel, Augusta, Ga.; and was recalled as rabbi to Curaçao in 1898. During part (1879-83) of his residence at New Orleans he was also editor of "The Jewish South," a weekly journal. Besides many sermons and discourses, he published "The Evidences of Free-Masonry from Ancient Hebrew Records," 1900, which reached a third edition; "La Revelacion," the first Jewish catechism in Spanish; and "Verdediging is geen Aanval," a correspondence between a Christian divine and a Jewish rabbi on Jesus as the Messiah. J. Voorsanger, in American Israelite, Oct., 1882. A. J. H. M. C.